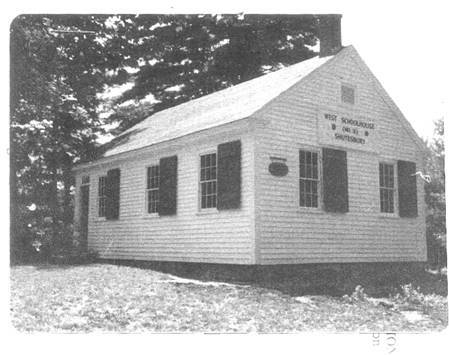 SOUTH SCHOOL is an historic one-room schoolhouse located in Shutesbury, Massachusetts, owned by the Sirius Community. It was built c.1830, although some records indicate that it may date to the 1790’s. It is currently listed in the National Registry of Historic Places. Shutesbury is a hill town in the Pioneer Valley, part of the Connecticut River Valley in western Massachusetts. It was settled in 1735, and incorporated as a town in 1761. Early settlers were a farming community of small homesteaders. By the early & mid 1800’s the inhabitants included small farmers, mill workers and the owners of many small cottage industries, whose sons & daughters attended the 10 one-room schoolhouses in town. Most of the young “scholars” walked to school or rode horseback, or in a carriage. The schools were placed in local neighborhood “districts” to be within a 1-2 mile walk or ride of local residences. By the early 20th century many of these schools had been replaced by more centrally located schoolhouses which were facilitated by modern transportation. Although the 19th century saw a gradual increase in population growth in Shutesbury, by mid-century it had peaked. The Homestead Act of 1861 attracted many of the early New England settlers to the newly opened & more easily farmed lands of the western and mid-western U.S. By 1928, Shutesbury, like many hill towns in Massachusetts had declined in population to almost the lowest level since it’s founding or apprx. 200. By then, only 3 schools remained opened: the newly Consolidated School near the center of Town where 25 pupils attended, and which by then had two rooms, and two outlying one-room schoolhouses, the SOUTH SCHOOL and the WEST SCHOOL. These were both closed in 1928-29, but both remain standing today. These are the only two remaining schoolhouses of the original 10 built in the town during the 19th century. The WEST SCHOOL, built in 1840 is owned and maintained by the Town of Shutesbury. The Sirius Community owns the SOUTH SCHOOL and is currently restoring the building to be used for teaching woodcarving, woodworking, sculpture, & traditional crafts as part of the Sirius Community on-going programs. On view are old maps, photos from the early 20th century, general information about Shutesbury history, as well as large framed prints from the era, including the work of Winslow Homer illustrating the schoolhouse era. SOUTH SCHOOL is an apprx. 500 sq.ft. 1-1/2 story wood frame building with chestnut beams & cedar clapboard siding. A Condition Assessment report has been done of the building by a local architect with the assistance of a grant from the National Trust for Historic Preservation. Although the school building is in fair to good condition, the sill beams from the original 180 year old foundation have deteriorated and need replacing. The building was re-roofed by the Sirius Community several years ago; however, siding, door, and windows are in need of repair, painting etc. While there once were hundreds of these schoolhouses across the state of Massachusetts, only a few now remain. In the neighboring hill towns of Leveret, Pelham, Conway, & etc., some have been restored and preserved to their original condition. Many generations of school children received their elementary school education in these buildings. 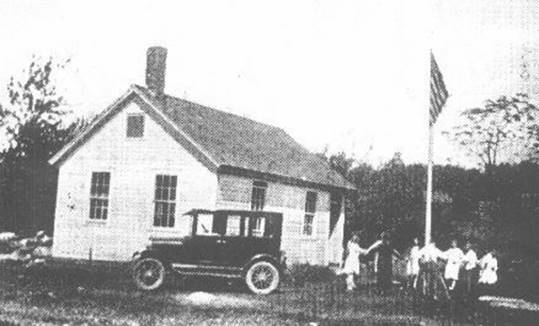 The SOUTH SCHOOL was in use for a span of 100 years. They all stand as reminders of a bygone era, a lifestyle and system of education of America’s 19th century rural past. The WEST SCHOOL, built in 1840 is owned and maintained by the Town of Shutesbury. The work of Winslow Homer, one of 19th century America’s finest painters & illustrators is often used by historians to indicate the form & character of mid-to late 19th century life. 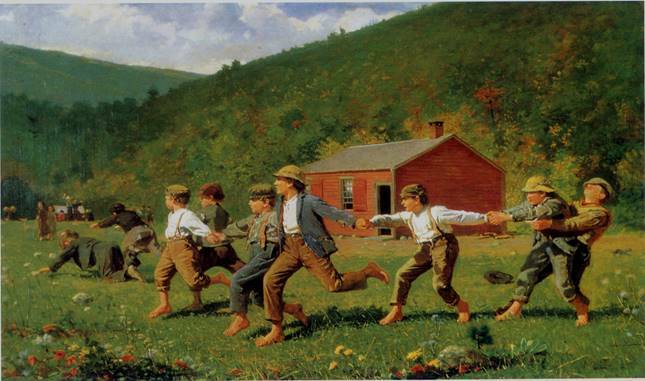 The painting shown above “Snap the Whip” shows young boys- often barefoot- taking a recess break outside the little red schoolhouse in the background. 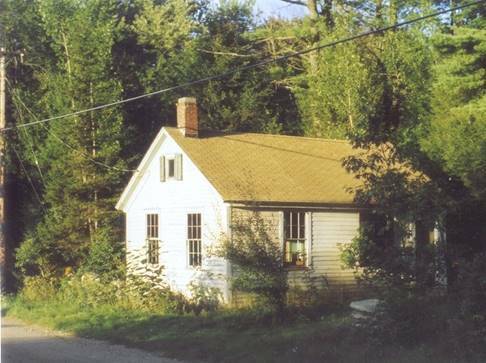 The rural farming communities of New England built schools with available materials which reflected the simple folk vernacular styles of the region. Schools often looked like farm out-buildings. Many were wood framed with chestnut beams, plentiful wood at the time, & cedar siding like the SOUTH SCHOOL of Shutesbury, MA. Some were painted red; others were painted white. Some were built of local stone or brick. Kerosene lamps were used for better reading light, and wood stoves heated the interior. Electricity did not come to rural Shutesbury, MA until the 1920’s. In 1789 the Massachusetts State Legislature decreed that towns having 50 or more families were required to furnish 6 months of schooling during the course of the year, in one or more schools. It also mandated the separation of towns into “districts”. The South School served as “District School No. 5” and later as “No. 8” as more schools were added. Within the districts, neighborhood committees were held responsible for providing teachers, and building and maintaining the schoolhouses. In 1869 the state ended the district system, and the towns were required to take over ownership and maintenance of the schools. The towns became financially responsible for the schools and taxed accordingly. A year later this was contested and towns were allowed to decide individually to reinstate the district system, or not. By then, however, many schools statewide were already “public”. That began a lengthy debate which was soon resolved as it became increasingly clear that in a rapidly developing country getting a job and earning a living required schooling as well as training. Many young “scholars” from these humble beginnings could go on to High Schools located in larger nearby towns. 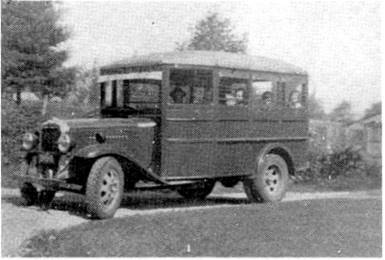 However, this was not always possible in the hill towns until the motor car, and early rudimentary school “buses” became available in the early 20th century. 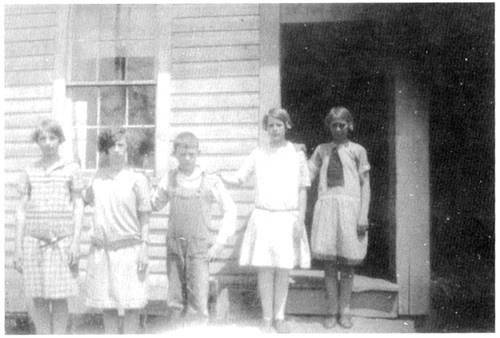 Older children often stayed on the farm or went to private boarding schools. 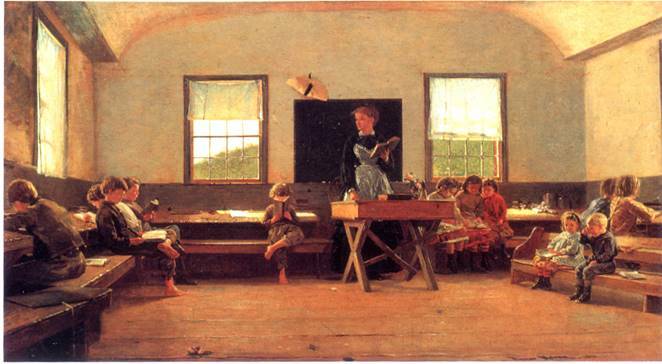 “The Country School” above shows a typical schoolhouse interior of the day. The schoolmistress is at the center of the school room in front of her desk, while children of mixed ages study or recite, sitting on benches at long tables that line the walls. This depicts a somewhat informal or nostalgic view of elementary school education of the time. However, one teacher often taught the equivalent of grades 1-8 in one room: children of four or five years of age to adolescents in their teens. Discipline was a problem, with frequent tales of confrontation and harsh punishment. Later on, older pupils were often used to teach the younger ones, but it wasn’t until late in the 19th century that individual desks set in rows by grade and the use of blackboards became the adopted norm. The evolution of school grades was a gradual process often necessitated by increasing numbers and varying ages. Oft-times pupils attended in late summer, late fall, and winter so they could work on the farms during planting and harvesting seasons. Shutesbury in 1875 had some 11,000 acres involved in farming, including a few prosperous farms, although many had left for the more fertile farmlands of the Mid-west opened up by the Homestead Act of 1862. Nearby, in Amherst, the Massachusetts Agricultural College was established as a land grant agricultural college in 1863. However, by 1925 the acreage farmed in Shutesbury had nearly halved. In 1870, 52 % of Americans worked in agriculture, by the turn of the century that figure was down to 38%. Mechanization and industrialized farming begun in the late 19th century changed it all. By 1980 that number was 25% and falling rapidly. The principal subjects taught in the schoolhouses were the time honored 3-R’s; ‘read’n, “rite’n, & ‘rithmetic. Literacy both of reading and writing was a major concern in the rural 19th century. These subjects were organized as Spelling, Reading, Arithmetic, and Grammar. Bible reading was often used, but became subject to separation of church and state issues. Later, Noah Webster’s spellers and the “McGuffey Readers” which sold upward of 100 million copies after their publication in the 1830’s. They drew on American sources and a growing nationalism. In later grades this was supplemented with Geography, History, Civics, and Physiology. Sometimes all the pupils would go through a sing-song drill together, spelling a group of words, reciting a multiplication table, or listing the capitals of the states: sometimes groups of three or four students would recite together, and at other times individual students would take turns going through a question and answer drill with the teacher, while the teacher managed (somehow) to keep the other youngsters occupied with work on various tasks. This was later relieved when older pupils taught the younger ones. In some areas vocational training was advocated, which usually meant woodworking & mechanics for the boys, and sewing, cooking, canning for the girls. These have even come down to our time as “shop” and “home economics”. 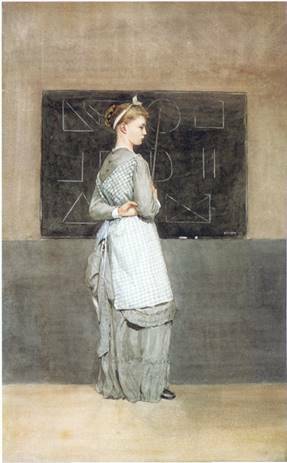 Art teaching and drawing instruction was considered valuable training in visual literacy and the development of personal expression, but also of practical importance in a developing industrial economy. In 1870, Massachusetts became the first state to mandate the teaching of drawing in its public schools. Simple geometric forms and outlines were taught as the earliest lessons to the youngest children. Louis Prang, Victorian artist & lithographer, also known as the man who invented the “Christmas Card”, published a number of art instruction booklets for children. Annual school plays often highlighted the school year, especially at holiday time. Singing, and choral groups often rounded out the curriculum. Recitations were frequent and the spelling bee was an institution which passed on well into the 20th century. Many new immigrants arrived in the early 20th century, but little changed until the 2nd quarter of the new century when the auto car and a new industrial economy significantly altered ther character of rural life. Larger, centrally located school buildings were built. Primary education became more structured and efficient, and subject to new educational methods & theories. However, many visitors to these older schoolhouses often express the wish that they could have attended school there. An interesting nostalgia, or sentimental view given the very real hardships and difficulties. Or perhaps, this is a reflection of Homer Winslow’s depiction of a “homey”, less formal, non-institutional character of life and times in a one-room schoolhouse.